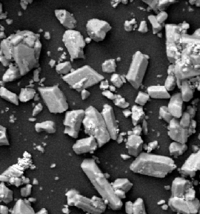 Lithium aluminum hydride (LiAlH4) powder, as observed with a scanning electron microscope. The name hydride is used for the negative ion of hydrogen, H−, and for compounds of hydrogen with other elements. Every element of the periodic table (except some noble gases) forms one or more compounds with hydrogen, and these compounds (especially those with elements in groups 1–15 of the periodic table) may be referred to as hydrides. Thus, the term "hydride" can be used very broadly. These compounds may be classified into three main types: saline (ionic) hydrides, covalent hydrides, and interstitial hydrides. The hydrides are called binary if they involve only two elements including hydrogen. 2 Compounds known as "hydrides"
Hydrides are useful for a wide diversity of applications. For instance, sodium hydride is a strong base used in organic chemistry; lithium aluminum hydride and sodium borohydride are reducing agents in chemical reactions; nickel hydride is found in nickel metal hydride batteries; and hydrides with arsenic and antimony (arsine and stibine) are used in the semiconductor industry. In addition, silane is used for the manufacture of composite materials, and diborane is a rocket fuel, semiconductor dopant, and reducing agent. Also, various metal hydrides are being studied for possible hydrogen storage in fuel cell-powered electric cars and batteries. Aside from electrides, the hydride ion is the simplest possible anion, consisting of two electrons and a proton. However, the free hydride ion is so unstable that it exists only under exceptional conditions. Interstitial hydrides, which may be described as having metallic bonding. Saline (or ionic) hydrides are ionic compounds, and therefore salt-like. They are solids with high melting points. In these cases, hydrogen is in the form of the anion (H−), which is combined with a highly electropositive element, usually one of the alkali metals or some of the alkaline earth metals (calcium, strontium, barium). Examples are sodium hydride (NaH) and calcium hydride (CaH2). In each ionic hydride, the hydrogen atom behaves as a halogen atom, obtaining an electron from the metal atom to form a hydride ion (H−). The hydrogen atom thereby fills its 1s-orbital and attaining the stable electron configuration of helium. If the metal is less electropositive, the metal-hydrogen bond becomes more covalent. Examples are MgH2 and AlH3. Such reactions are heterogeneous, the KH does not dissolve. Typical solvents for such reactions are ethers. Water cannot serve as a medium for pure ionic hydrides because the hydride ion is a stronger base than hydroxide. Hydrogen gas is liberated in a typical acid-base reaction. Alkali metal hydrides react with metal halides. For example, lithium aluminum hydride (often abbreviated as LAH) arises from reactions with aluminum chloride. In covalent hydrides, hydrogen is covalently bonded to an element in the p-block of the periodic table (boron, aluminum, and elements in groups 14-17), as well as beryllium. The hydrocarbons and ammonia could be considered hydrides of carbon and nitrogen, respectively. Charge-neutral covalent hydrides that are made up of small molecules are often volatile at room temperature and atmospheric pressure. Some covalent hydrides are not volatile because they are polymeric (i.e., nonmolecular), such as the binary hydrides of aluminum and beryllium. Replacing some hydrogen atoms in such compounds with larger ligands, one obtains molecular derivatives. For example, diisobutylaluminum hydride (DIBAL) consists of two aluminum centers bridged by hydride ligands. Hydrides that are soluble in common solvents are widely used in organic synthesis. Particularly common are sodium borohydride (NaBH4) and lithium aluminum hydride. Transition metals form binary hydrides in which hydrogen atoms are bonded to the metal atoms, but the exact nature of those bonds is not clear. In addition, the ratio of hydrogen atoms to metal atoms in a number of these hydrides is not fixed. The lattice of metal atoms contains a variable number of hydrogen atoms that can migrate through it. In materials engineering, the phenomenon of hydrogen embrittlement is a consequence of interstitial hydrides. For example, palladium absorbs up to 900 times its own volume of hydrogen at room temperature, forming palladium hydride, which was once thought of as a means to carry hydrogen for vehicular fuel cells. Hydrogen gas is liberated proportional to the applied temperature and pressure but not to the chemical composition. Interstitial hydrides show some promise as a way for safe hydrogen storage. During the last 25 years, many interstitial hydrides were developed that readily absorb and discharge hydrogen at room temperature and atmospheric pressure. They are usually based on intermetallic compounds and solid-solution alloys. However, their application is still limited, as they are capable of storing only about 2 percent (by weight) of hydrogen, which is not enough for automotive applications. Most transition metal complexes form molecular compounds described as hydrides. Usually, such compounds are discussed in the context of organometallic chemistry. Transition metal hydrides are intermediates in many industrial processes that rely on metal catalysts, such as hydroformylation, hydrogenation, and hydrodesulfurization. Two famous examples, HCo(CO)4 and H2Fe(CO)4, are acidic, thus demonstrating that the term hydride is used very broadly. When a dihydrogen complex loses a proton, a metal hydride is produced. The anion [ReH9]2- (nonahydridorhenate) is an example of a molecular metal hydride. Protide, deuteride, and tritide are used to describe ions or compounds, which contain enriched hydrogen-1, deuterium or tritium, respectively. According to IUPAC convention, by precedence (stylized electronegativity), hydrogen falls between group 15 and group 16 elements. Therefore we have NH3, 'nitrogen hydride' (ammonia), versus H2O, 'hydrogen oxide' (water). Various metal hydrides are currently being studied for use as a means of hydrogen storage in fuel cell-powered electric cars and batteries. They also have important uses in organic chemistry as powerful reducing agents, and many promising uses in the proposed hydrogen economy. ↑ An electride is an ionic compound in which an electron is the anion. Brown Jr., Theodore L., H. Eugene LeMay, Bruce Edward Bursten, and Julia R. Burdge. 2002. Chemistry: The Central Science. 9th ed. Upper Saddle River, NJ: Prentice Hall. ISBN 0130669970. This page was last modified on 29 March 2014, at 15:22.